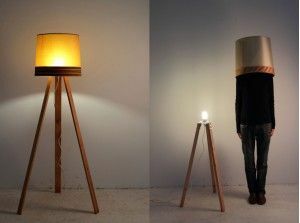 Project by Ramon Parramon in collaboration with Maral Mikirditsian and Laia Solé. 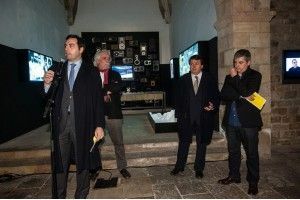 Round table with the participation of David Juárez – Straddle3; Diego Peris – Todo por la Praxis; Alberto Flores and Mireia Juan – Makea; Santiago Cirugeda – Recetas Urbanas and Gaspar Maza, Professor of Anthropology at the Rovira i Virgili University. - Displaced Legal Application #3 F.I.E.S. Debate surrounding the project of Núria Güell with the participation of Daniel Pont and Amadeu Casellas. 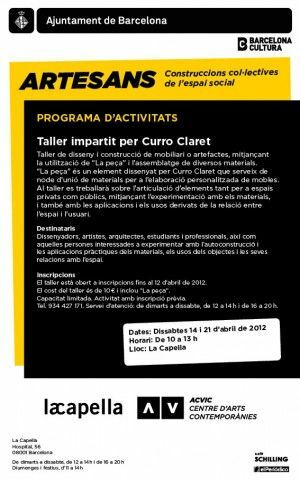 - Workshop by Curro Claret with students from the advanced training programmes in Applied Arts in Sculpture and Industrial Modelling at the Massana School of Art and Design (UAB). From 7 March to 20 April. La Capella and Escola Massana. At a time when we are inundated with things, objects and artefacts, it is important to reflect on their value, how they were made, how we use them in our everyday lives and the extent to which we share them. 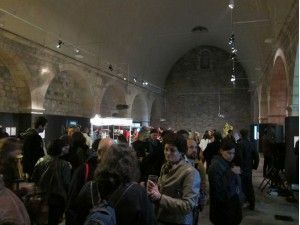 This exhibition is entitled “Craftsmen and Women” for two main reasons. The first is the ageold conflict between art and craft, the tension polarised between the concept and construction, between genius and occupation, between the effect and persistence, between uselessness and practical utility, between that which is sublime and that which is everyday, between that which is high-brow and that which is popular. This divide, fought over and widened over the years, has occupied a battleground – at an academic level as well – between the fine arts and the arts and crafts, between speculative research and applied research. 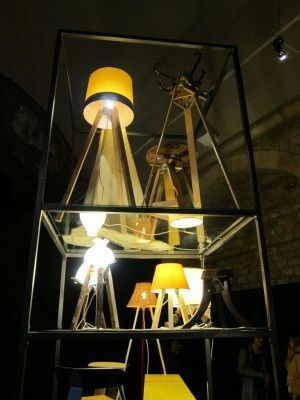 It is a debate that is of special interest now that many creators are taking up aspects typical of the traditional crafts such as a mastery of techniques, the revival of proximity vis-à-vis the material they work on, painstaking care in the process, self-build, self-management, and the functionality and reproducibility of things. 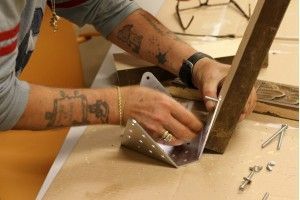 This is an important element that presupposes that the ways things are done and the items that are made can be learned and reproduced by other people. Art and craft can both seem to be concepts that are behind the times in these over-productive contemporary days, in which the use of things has tended to become banal and in which work is directly related to contingency and transitoriness, and less so with the process of learning and loyalty to a trade or company. Contrasting and complementing them is intended to rekindle values that remain meaningful today. And this is the second reason for the title of the exhibition, an allusion to the book The Craftsman,1 in which the author, Richard Sennett, analyses and expands the concept of craftsmanship, encompassing within it a series of current practices and professions, based at all times on continuing historical references, which are linked by a vocation to produce well-made pieces as an end in itself. From here, and steering it towards the exhibition, we have taken the idea that people can learn from themselves through the things they produce, forging a relationship between material culture and the space. 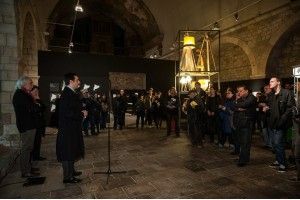 In this instance, the idea of “Craftsmen and women” is a reference to the fact that all the projects presented in the exhibition are based on an experience of material or intangible construction, which combines aspects founded on collective effort, the transfer of knowledge, and the relationship with the territory or the social space. 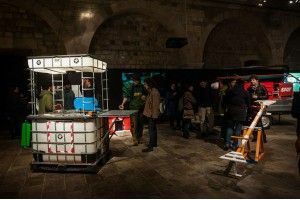 The exhibition carries the complementary subtitle of “Collective Constructions of the Social Space”, thereby emphasising the self-managed social processes that have given rise to collective strategies, have forged links and sought alternative systems for citizens, related to or through creative practices. One of the contemporary experiences that have most obviously brought about changes in the social, political and cultural context is the series of practices that result in computer tools and technologies being built using open-source code. A mechanism based on sharing outcomes and processes, and in which the achievements made by one group or an individual are a springboard for others. A sequence or chain of elements that combines creativity, skill and material production, built and consumed through shared experience. 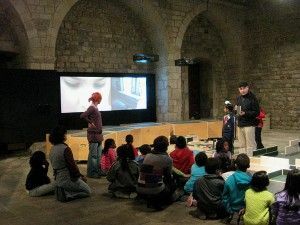 This dual complementary connection between craft and open source brings us to a series of questions to do with the connection between citizens, creative practices and processes that have an impact on the social space: Is it possible to design and build the city using the logic of shared creativity? How is a collaborative project structured and who can take part in it? Self-sufficiency, shared responsibility, alternative practices… what are the connections we can forge with other, more institutionalised practices? Can social critique become a tool for transformation? How can new cultural practices be generated? How can they transform the social space? Is it possible to produce alternatives to today’s economic models from the perspective of applied creativity? This exhibition project has been put together by selecting a series of works, all of them linked to the ACVic Contemporary Arts Centre at different times and in different areas of its work, which focuses on the relationship between art, education and territory. 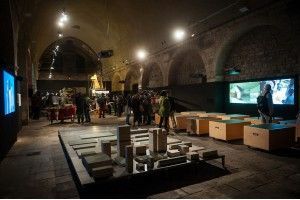 It consists of a thematic re-articulation based on projects that have featured in the centre’s programme of exhibitions, educational projects or production. 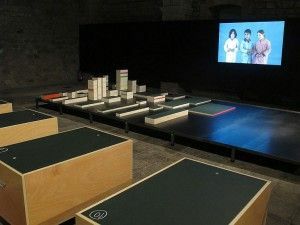 This selection has served to structure an exhibition space that is part store, part workshop and part place for debate, in which a number of activities will be pursued during the exhibition. 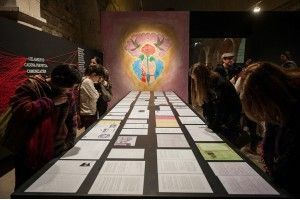 The exhibition itself makes reference to processes of creation and socialisation that are usually not visible but which determine the meaning and existence of the projects presented in it. They are all a response to an idea of collective creation, of complex projects that set processes in motion, that are catalysts of ideas and are propositionally reproducible. 1. Sennett, Richard: The Craftsman, Allen Lane, London, 2008. One of the pillars of the work of the ACVic is bringing art and education together. 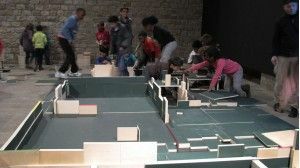 Al portal de casa_ i els constructors_ by Jordi Canudas made it possible to pursue a complex project over the long-term that forged connections between various institutions in Vic: a primary school, an art school and a neighbourhood plan. 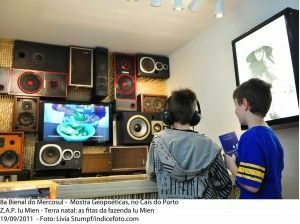 The project links the experience in the neighbourhood (territory), the involvement of teachers and pupils at the school (education) with elements that create an image, represent, express content and cast a critical and analytical eye at the environment (art). 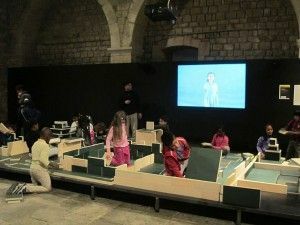 Al portal de casa_ i els constructors_ is a powerful response to the question of whether it is possible to carry out a project that is both educational and aesthetic. 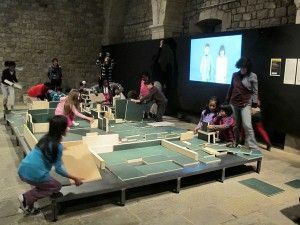 It presents a model of work developed by the teaching staff and pupils at the La Sínia School under the direction of Jordi Canudas and with the participation of a group of collaborators linked to the Vic School of Art and Design and the El Remei Neighbourhood Plan. 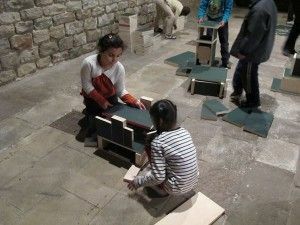 During the course of the work, the pupils continued their usual learning, guided by their teachers, but in this instance what connected the various ambits of knowledge had been structured on the basis of an artistic project. They were linked in a collaborative team working together, involving teachers, pupils and collaborators who participated in the construction of an art project based on cross-disciplinary learning, the exploration of the territory, the sharing of experiences with relatives and neighbours, and the representation of formal elements that refer not only to home interiors but to the street as well. The objectives behind this included generating another way of looking at the reality in the neighbourhood, analysing and understanding the social and architectural space in it and going outside it to compare, evaluate and explain it to people living in other neighbourhoods in the city or in other cities. The knowledge and content generated are epitomised, formalised and contained in the various elements that make up this part of the exhibition. 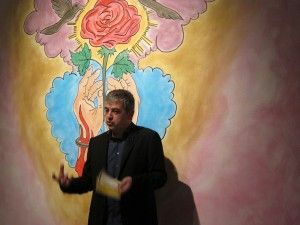 What we have here is an example of art’s capacity to connect various places, to rebuild stories and narratives that have been structured by the people that live in a specific place. 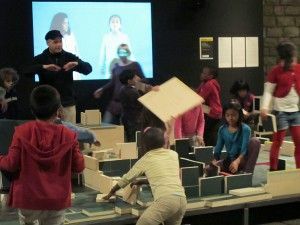 A community made up of numerous communities in which the common denominator between the narratives, the people and the space is the neighbourhood. The neighbourhood is also the place where the school teaches pupils to learn. 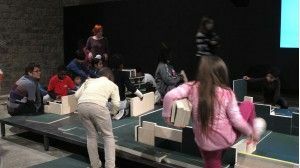 This experience can be understood through the ambits of art and education but also from the perspective of a crossboundary determination that links them. This section is directly linked to an exhibition currently on show at the ACVic about the relationship between design, art and society. The exhibition, curated by Curro Claret, features a selection of works by designers and artists and is intended to present an open, complex vision of an attitude and a way of doing things founded on involving people in the construction of the environment. The overall idea is that what matters most is not just the final object but above all that which it is capable of promoting, generating, catalysing and socialising. Saying that design must be useful might seem an obvious remark; saying that art must be useful might be regarded as a political stance. The title of this section questions the fact that design does not always respond to criteria intended to improve people’s quality of life, and that art is not so indifferent to this issue. Consequently, it is a point of convergence that can place design and art on the same level in relation to the social context. On display here is La peça, one of the latest pieces by Curro Claret, who has conducted a research project involving the generation of a collection of self-built furnishings and household items based on the design of a number of metal parts. These parts can be used to build furniture and objects of various types and functions from found materials. 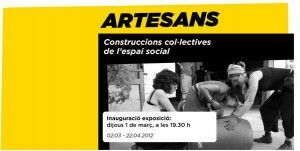 The ultimate aim of the project is for these furnishings and items to be made by collectives working in the field of social inclusion and which believe that construction is an activity that can help people in their recovery process. The archives for making the metal parts are freely available to any organisation that requests them so long as it is not for commercial purposes. Consequently, any organisation can itself commission the metal parts it needs and subsequently make the objects. 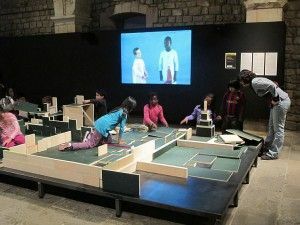 One of the areas of work pursued in the ACVic programming is positing strategies concerning the use of public spaces and rethinking artefacts that facilitate the dynamics of relationships or explore new ones. 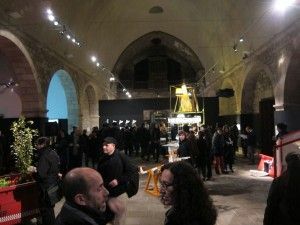 In this instance, the exhibition features works generated in the context of QUAM 2011, entitled Wikpolis, or projects undertaken with the collaboration of Idensitat. 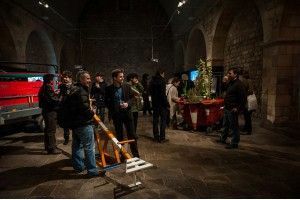 On display are projects by Santiago Cirugeda, Straddle3, Todo por la Praxis and Makea, objects built using self-man· aged creative practices and collective strategies that are networked together and which seek to have an impact on social processes by means of alternative systems for citizens. These items of fur· niture and mobile devices are intended to activate spaces used collectively or to compare them. Most of these devices were made in workshops and so the construction experience was collective. Decision-making was conditioned by agreements and negotiations between the participants, but also the external agents who had ordered the devices or were subsequently to use them. 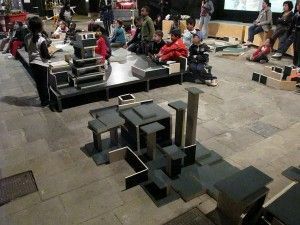 They are proposals that respond creatively to the sophisticated regulation of public spaces, seeking ways that demand a more self-managed and freer use of the space. Estrategias subversivas de ocupación urbana, Banco Guerrilla and Wikitankers are all clearly war-related ti· tles for these objects that propose tem· porary occupations of the public space and which employ strategies to ensure that citizens will become involved as active agents in urban transformation. This ambit was inspired by the early practice of Santiago Cirugeda (Recetas Urbanas), which later spread rapidly thanks to the Arquitectures Col·lectives network. 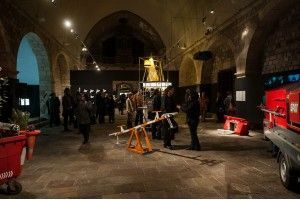 This section consists of a revised and updated selection of works that were part of the exhibition “Measuring in Spans. 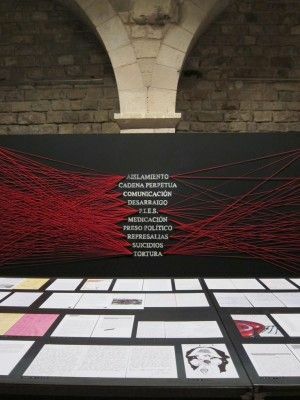 Charts, Metrics and Policies of Space”, curated by Maral Mikirditsian, Laia Solé and Ramon Parramon. 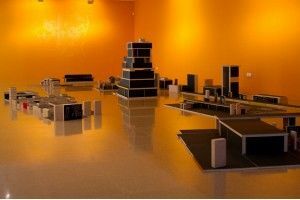 All the works on display propose alternatives to the more conventional forms of representation of the space, the way it is interpreted and lived in. Some reveal latent conflicts in the territory and generate maps that help to interpret them. Others refer to self-managed social processes that use cartography to activate collective strategies, to network and to seek alternative systems for citizens. 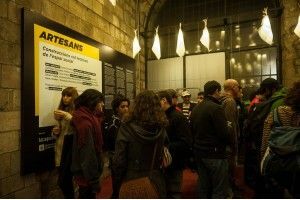 Apamar, the opening word of the original exhibition title in Catalan, means not only ‘measuring in spans’ but also ‘knowing in depth’. Measuring in spans, being aware of having a mastery of a technique, a circumstance or a situation, necessarily entails a subjective knowledge of the context. The exploration of the territory, critical cartography, the selection and presentation of data, information processing and collective construction are aspects related to subjectivity and at the same time to the socialisation of the space. The participating projects deal with the diverse qualities intrinsic in geographical maps: they experiment with this seemingly conventional form, faithfully retaining some of its main attributes such as accuracy, usefulness and deliberate objectivity, while creating new models from a critical perspective with the intention of proposing alternatives. As a group, they are clearly political tools that serve to point to and expose to the public eye spaces in conflict. In some instances, these pieces have launched collective processes while assaying new tactics that enable citizens to play a part in the structuring of the social space. 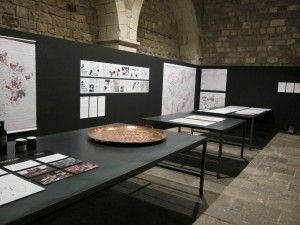 For example, Beirut: Mapping Security, by Mona Fawaz, Ahmad Gharbieh and Mona Harb, analyses the various types of the security measures put in place in the city of Beirut due to the armed conflicts that the country has suffered since the 1970s. Geografie dell’Oltrecittà and Agroculture nomadi, by Stalker / Primavera Romana, are projects that generate and share social knowledge and an awareness of urban transformations. 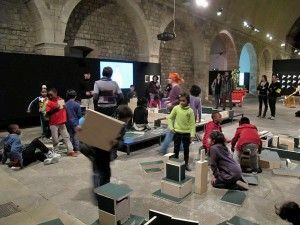 Mapeo colectivo, by Iconoclasistas, is a fun and creative tool that facilitates and promotes the construction of a critical and collective account in order to expose the problems of the space, be it geographical or social. 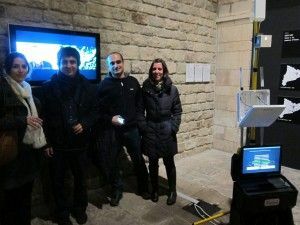 Guifi.net is an open, free and neutral telecommunications network that was set up as a result of an interconnection agreement and which uses fibre-optic or wireless technology. Nodo Móvil, by Efraín Foglia, is a free transmission station, a wireless telecommunications infrastructure that allows people in the urban environment to connect to the Web using the technology and spirit of Guifi.net. Within this same thematic ambit, one of the latest works by the Torolab collective is displayed in a specific manner. Their Homeland project studies the construction of places of origin and their impact on the identity of displaced communities of immigrants and refu· gees. Since 2009, Homeland has oper· ated as a platform for research into the traditions, transitions and translations of the Iu Mien community, which, after a long journey through China, Vietnam, Laos and Thailand, settled in Oakland (California) in the 1980s. 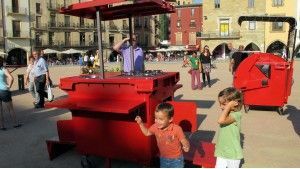 The project looks at the cultural diversity of this community and their ability to integrate into and adapt to their new environ· ment. The result of this study is shown in the form of mechanisms that seek to revive and preserve the Iu Mien oral tradition of stories and songs, as well as their work ethic. Critique is an ambit that art has adopted as its own. It is in any case unusual for critique to take on a propositional and transformative role. The work of Núria Güell is in keeping with this strategy, as it not only points to conflicts but takes on the role of mediation and direct involvement in order to channel possible alternatives. Her project Aplicación Legal Desplazada #3: F.I.E.S. 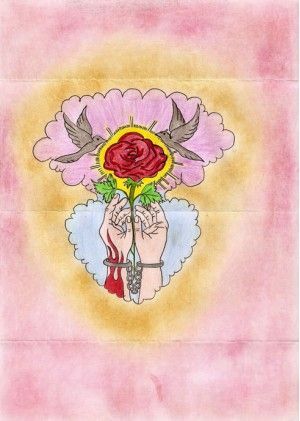 includes various testimonies and documents (poems, letters, drawings, and statements) concerning the prisoners held under the system of F.I.E.S. (the Spanish abbreviation for Internal Special Monitoring Files). This system consists of a series of measures, based on intensive control and surveillance, used by the Spanish Penitentiary Authority, the intention being to obtain more information from the inmates concerned, of which there are several categories. Applied since 1996, this category was declared null and void in 2009 by the Supreme Court. In 2011 the Ministry of the Interior amended certain sections of the Prison System, once again legalising the practise. There is an open struggle driven by prisoners and supporting organisations against its regulations. Núria Güell contacted the prisoners in the F.I.E.S. 1 category and invited them to write a letter to be included in this project, which, in her own words, deals with the “institutional torture” these people are subjected to. All the letters have been compiled and can be viewed in the online archive at: http:// acvic.org/fies. Design and construction of furniture or appliances workshop, using "The piece" and the assembly of various materials. "The piece" is an element designed by Curro Claret serving as a node for connecting materials in the crafting of custom furniture. 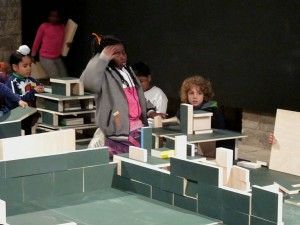 The workshop will focus on putting together elements for both private and public spaces, through experimentation with materials, uses and applications arising from the relationship between space and the user. Designers, artists, architects, students and professionals, as well as those interested in experimenting with do-it-yourself and the practical application of materials, use of objects and their relations to space. The workshop costs 10 eur. and includes "The piece".